Arrive in Beijing, the capital of China, greeted by the local guide at the airport and transferred to the hotel. Morning tour starts with the Forbidden City, in scripted as a UNESCO World Cultural Heritage Site in 1987.
for an overview of Beijing until arrive for leisure tour to the Summer Palace. which was built 800 years ago. It is the second largest and best-preserved royal garden in China, with 294 hectares including the beautiful and serene Kunming Lake. Before returning to the hotel, take a leisure walk around Tian'a Men Square (Heavenly Peace Gate) to admire the grandeur of the largest public squares in the world. Visit the Great Wall, one of the eight ancient wonders of between 6000- 6500km long built over several centuries to keep out the invading northern tribes. After a hike along a portion of the wall, visit the Ming Tombs area, a secluded valley housing 14 imperial burial mounds. 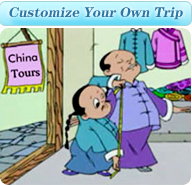 Then proceed to the cloisonn factory to appreciate the marvelous Chinese traditional handicrafts. Evening special dinner featuring Beijing roast duck and the China Acrobatic show. Fly to Shanghai in the morning. upon arrival, visit the Yu Garden in Shanghai old city and at the same time experience Shanghai recently gained modernity. Visit the riverfront bund and in the evening visit the Oriental TV Tower-- the Pearl of the East. Drive to suzhou in the morning and appreciate the elegant classical Suzhou garden with a tour to the garden of the Master of Nets to understand the art of Chinese aesthetics through every rock, waterway, plant and flower. Suzhou has been the silk trade center of China for centuries, visit the silk embroidery research institute and silk factory to see how silk is produced and dyed. Day 06 Suzhou/ Shanghai Boat trip on the Grand Canal in Suzhou. Bus back to Shanghai, visit the Grand Museum and then free time. Morning flight to Mt. Huangshan. UNESCO officially recognizes Mt. Huangshan as a world heritage cultural site in 1990: Its immense beauty covers 154 square kilometers with numerous peaks decorating the misty skyline. lotus, brightness apex, and celestial capital peaks are the three major ones, all rising above 1,800 meters. The mountains are a body of granite, often with vertical joints. erosion and fracture contributed to the shaping of the rocks into huge columns, giving rise to lofty peaks and deep ravines. When it is cloudy the pinnacles loom in mists as if they were illusionary, and while the sun is shining they unfold all their majesty and splendor, capturing the owe some nature in its true wonder. After breakfast, ascend to the top of the mountain by cable car and enjoy the attractions of Huangshan. you would be enchanted by bizarre contoured pine trees, fantastic rock formations, seas of cloud and budding hot springs. In addition, you will find the diversified fauna, plants, flowers, herbs in Huangshan most fascinating for research purpose also. Accommodations are at the top the mountain. Rise early to catch the glory of the rising sun bathes the nearby peaks and pavilions in a shower of light. Descend the mountain by cable car. Enjoy your own leisure and take a stroll on the old walking street in the Tunxi old town. The ancient street was built about 700 years ago in the Song dynasty; It is about 1.5 km long and lined with hundreds of old but well-preserved elegant shops. Drive to Hong Cun (village) and Xidi village, old villages now one of the UNESCO World Cultural Heritage sites in China. Most people knew about this area from the film "Crouching Tiger Hidden Dragon" which was shot on site here. These villages demonstrate classical Ming and Qing dynasty residential architectural style. There exists a unique irrigation and waterways system that rendered the villagers with direct access to water already hundreds years ago. After breakfast fly back to Shanghai. Meet and transfer to the hotel. the rest of the day is free. After breakfast transfer to the airport for your departure flight.